I would like to commend you on your prompt apology for the e-mail – excuse me, I mean “electronic direct mail” or EDM – sent by your marketing communications department canvassing for advertisements on Channel NewsAsia during its “comprehensive coverage” of the earthquake and tsunami in Japan. And so what “if” you were? It’s not like you were actually being insensitive – you were only “seen” as being insensitive. And who are the people doing the “seeing”? It’s those pesky “netizens”. It’s their fault. They had criticised the EDM as “opportunistic”, “unsavoury” and “despicable”. In your apology, Mr Koh has clarified that the EDM was meant for a “targeted group of clients and agencies”. The implication is that, unlike netizens, these clients and agencies would appreciate the opportunistic, unsavoury and despicable nature of the EDM. You were only catering to their needs. It’s because of these clients and agencies that you were “seen” to be insensitive. If anything, they should apologise to you. What’s the big deal anyway? 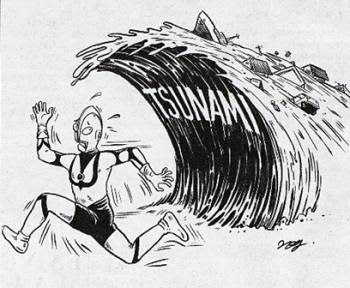 It’s not like you drew a cartoon of Ultraman running away from a tsunami. 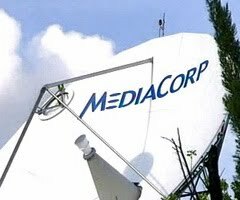 I believe that MediaCorp has already made up for any perceived gaffe by raising more than $4.25 million for the Society for the Physically Disabled with a live charity show on Channel 8 two days after the earthquake. Well done! Channel NewsAsia reported that the highlight of the show was a “breathtaking” sand dance performance by MediaCorp stars Fann Wong and Christopher Lee. So much for focusing attention on the Japan tragedy. Hey, life goes on, right? Otherwise, the earthquake has won. Breathtaking, indeed. There is, however, one thing in the EDM that I find unforgivable that you should apologise for – but didn’t. The EDM said that the earthquake unleashed a tsunami that “wrecked havoc” on coastal towns. As über netizen Mr Brown pointed out, the correct word is “wreaked”, not “wrecked”. Are your EDMs written by Ris Low? Or Phua Chu Kang? Even your targeted clients and agencies would not be impressed. Mr Koh said that the staff member concerned had been “counselled to be more circumspect”. Maybe that staff member should just be sent for English classes. Shiver me timbers! It's back from the dead! What next after A levels? Show you the money!